Monle Sayadaw was born on Friday 1am, on the 13th Wanning of Nattaw, year 1282 Myanmar Burmese) Era at West Gangaw township. He was named as Maung Wa Thein. 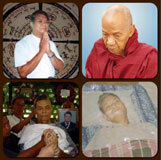 Monle Sayadaw�s parents were U Ngwe Tun and Daw Sae Yan. He is the third child among the four siblings. His mother died when he was three. At the age of fourteen, he was ordained as an sāmanera (novice) under the guidance of his preceptor, Moke-U-Kyaung Sayadaw U Thawbita with the sponsorship of his step-mother - Daw Sae Thawe. He was named sāmanera Ashin Sanvara. After one year he left the sāmanerahood and became a layman. He earned his living as a salesperson. At the age of twenty-four he was married to Daw Chit Myaing from Shone Shi village. He had four children. His wife died when he was the age of 46. He wanted to become a monk even before his wife expired . He had collected the accessories for monkshood and took daily eight precepts since. After he had fulfilled his duties as a responsible parent and when the children are grown-up and settled, at the age of 56, he was again ordained as an sāmanera under the guidance of Sayadaw U Zagara. At the age of 57, Ashin Sanvara took higher ordination under the instruction of his preceptor Sayadaw U Thawbita. His higher ordination was sponsored by U Aye Pe and Daw Ohn Kyi. After six vasas, he took Mogok vipassana training under guidance of two meditation masters, Mingala-Kyaung-Taik Sayadaw U Dhamisara of Mandalay Myo-haung, and Myo-Haung Taung-Pyin Taik Sayadaw U Sunmana. He started his missionary work in April of 1990 in Yangon through the sponsorship of his devotees Lt. Major Thet Shay, Dr Jenny Ko Gyi, U Hla Myo and Daw Khin Win Maw. Si-Thu U Ko Gyi and Daw Ahmar. Since then he came to Yangon every year to conduct the meditation course. The devotees temporary donated their residence and compound as the meditation Hall and men and women yogi�s quarters. Later on U Hla Myo and Daw Khin Win Maw donated six acres of land at Inndagaw Say-mi-gone, Pegu to establish �Monle Sasana Yeitha� meditation center. Editor and Chief of Dhamma Pictorial Magazine and �The Promotion of Kalayana Puthuzin Association� invited Sayadaw to Yangon to give meditation course every year. He continued to spread Dhamma not only in Yangon but also in Pegu, Mandalay, Taung gyi, Myitkyina and many other cities in Myanmar. He had also traveled to USA and Australia to give meditation courses. His permanent residence is at Inndagaw Say-mi-gone Sasana Yeittha, Pegu where he gave meditation courses since May of 1997. In 1999 Burmese Peace and Development Council honored him Agga-maha Kamathana Cariya.